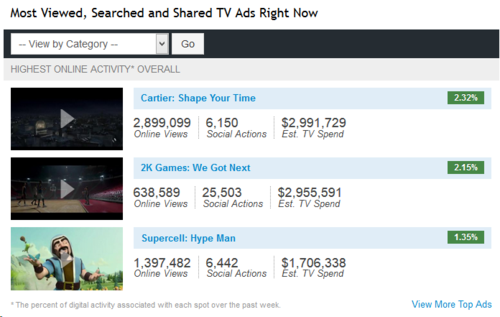 Cartier surprised observers by launching TV advertising that shot to the top tier of most engaging commercials on iSpot.tv’s weekly leaderboard. Big spenders like Samsung, Budweiser and Microsoft, had to make room this week for Cartier’s new commercial, “Shape Your Time,” as it bowed on September 28, 2014 on Football Night in America, the lead-in to NBC’s Sunday Night Football. The online buzz around the ad did not pick up until the early AM hours on Thursday, October 2, 2014 when 90-second versions aired on Comedy Central (At Midnight), and throughout the morning on ESPN. By the end of the weekend, the ads online engagement had increased almost tenfold, and had racked up more than two million earned online views to go with almost 100,000 social and search interactions. It is somewhat unique to see a brand run such lengthy creative first on TV, and then reap rewards online. The lengthier creative is often rolled out online and evaluated, only then to be cut into 30 seconds for TV. In the case of “Shape Your Time,” Cartier set out from the beginning to produce and spend behind 60 to 90 seconds of TV time, and the production quality and creative flair that was given the spot makes the most of this added time. Cartier is a venerable yet small brand on TV. It clearly has made the most of its TV budget by launching exceptional creative that leveraged its entertainment value to generate significant online activity. Cartier doesn’t often appear on TV, but it has done well to be sure consumers notice when it does.